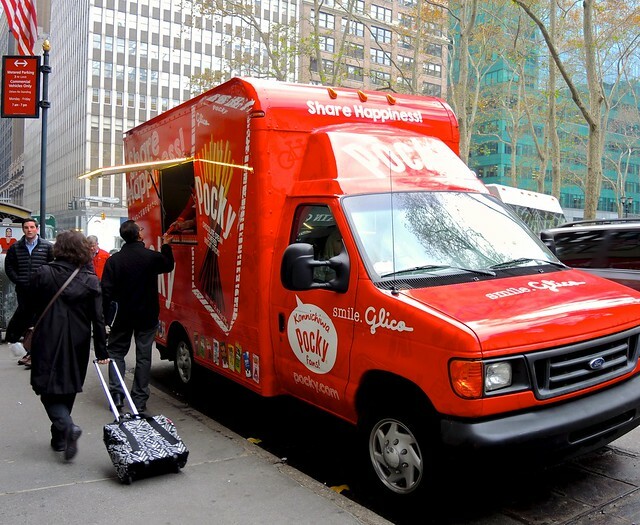 There it was, on West 40th Street, parked directly across from Bryant Park. A bright red panel truck painted with large graphic designs. Passers-by were approaching the truck, reaching up to the folding window cut into its side, taking something from the hand that appeared, and walking away. 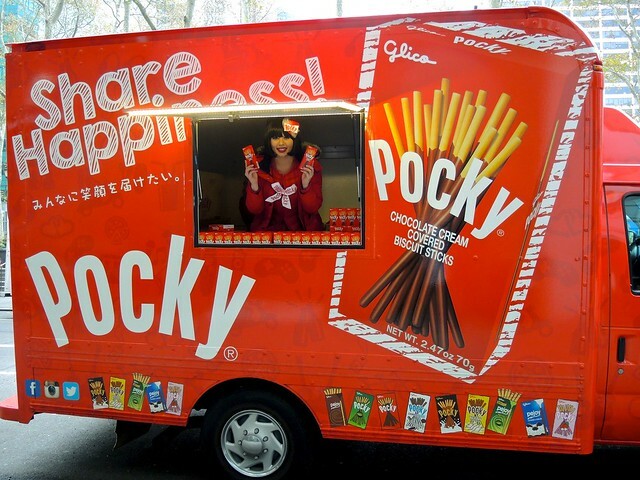 It was the Pocky truck. 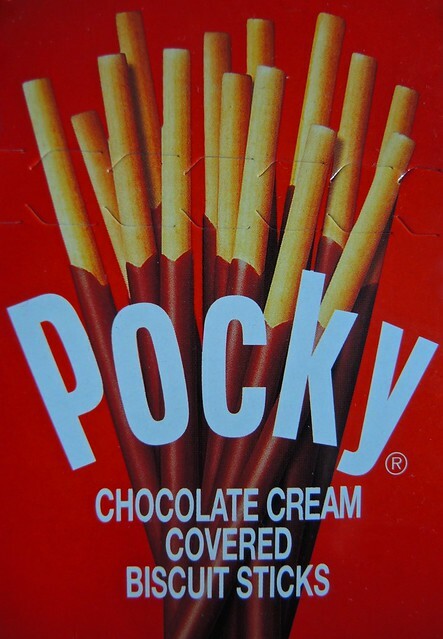 The original Pocky was dipped in chocolate, but it now comes in a variety of flavors including strawberry, chocolate banana, cookies & cream, almond crush, and green tea. 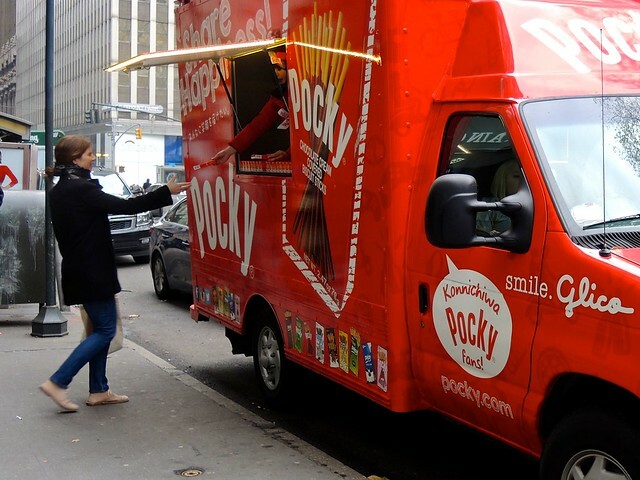 While only a handful of flavors are sold in the US, Pocky lovers in other countries have access to different shapes and sizes, limited editions, and seasonal flavors. The Chinese enjoy peach flavored Pocky, and blueberry dipped Pocky is popular in Thailand, but the greatest variety is available in Pocky’s home country, where the slim snack has developed an almost cult-like following. 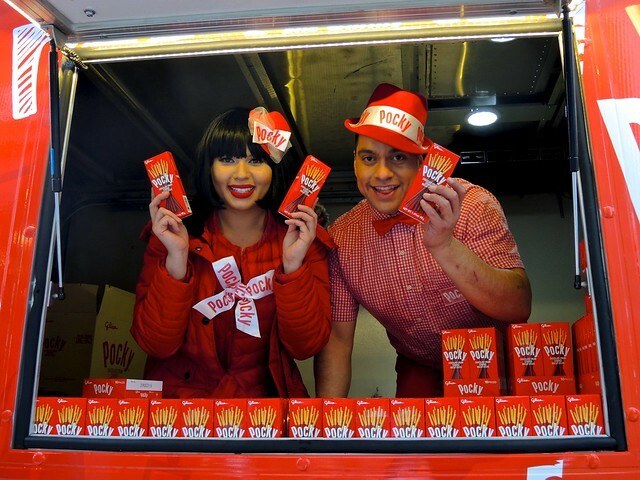 In fact, in Japan, November 11 is designated as Pocky Day because the date, 11.11, looks like four Pockys in a row. The date has been certified by the Japan Anniversary Association and is registered as an official national commemorative day. 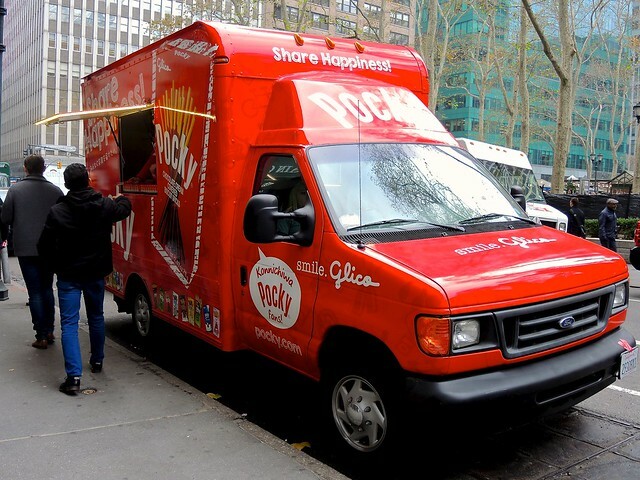 On the most recent Pocky Day, Pocky broke Twitter’s record for the most tweeted brand name in a 24-hour period, racking up 1,843,733 tweets. So, what was that about a giveaway? To spread the joy of Pocky, I will be giving a pack of the original chocolate dipped cooky sticks to a Blather From Brooklyn reader. 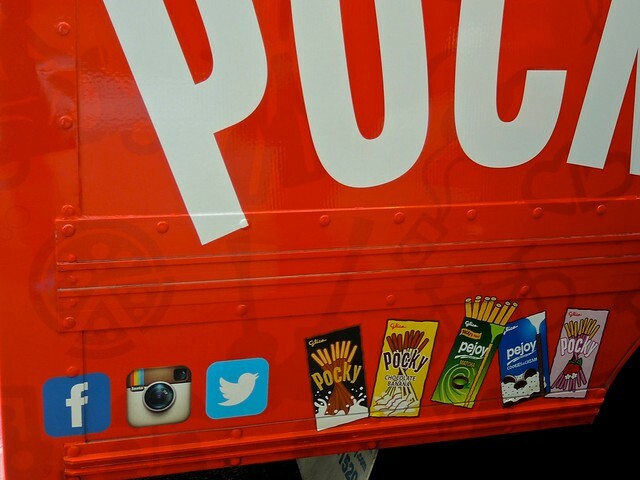 For a chance to crunch into a Pocky, leave a comment on this post. Want a second entry? Comment on a different post. Third entry? Same deal. The winner will be randomly selected and contacted via email (so please be sure to provide your email address). Sorry, US only, as there seem to be some bizarre rules regarding the mailing of food overseas. The deadline for all entries is Sunday, December 27, 11:59pm (Eastern Time). Good luck! Update: The giveaway is closed. Many thanks to all who participated; I enjoyed reading your comments. The winner is Jerry Marquardt! Thanks again; I plan to hold another giveaway soon. Yes, I got a pack! You are currently browsing the Blather From Brooklyn blog archives for December, 2015.